The founders of our Republic envisioned education as providing for all citizens the necessary apprenticeship in the understanding and practice of democracy. To make democracy safe we must have universal schooling; to make schooling safe for education we must have democracy. But since the founding of our country the study and practice of democracy in our schools has weakened. We must return to the primary purpose of education and ensure that it is indeed for everyone. The Agenda for Education in a Democracy proposed by the authors is more than an effort to simply revitalize a faltering civics curriculum. It is about restoring a shared humanity to the educational process. It is about the need to make caring, compassion, freedom, dignity, and responsibility central to the mission of schooling. It is about placing power and responsibility—a concept more demanding of the individual than is accountability—in the hands of those who need and deserve it. It is about taking the idea of excellence seriously. It is about taking democracy seriously. It is about having real faith in real people to do what is right, just, and honorable. John I. Goodlad is president of the Institute for Educational Inquiry and professor emeritus of the University of Washington. He is the author or coauthor of numerous books including Developing Democratic Character in the Young, Educational Renewal, The Moral Dimensions of Teaching, and The Public Purpose of Education and Schooling, all from Jossey-Bass. Corinne Mantle-Bromley is executive vice president of the Institute for Educational Inquiry and research professor at the University of Washington. She is a former classroom teacher and associate professor at Colorado State University with research interests and publications most recently focusing on school-university partnerships for educational renewal. 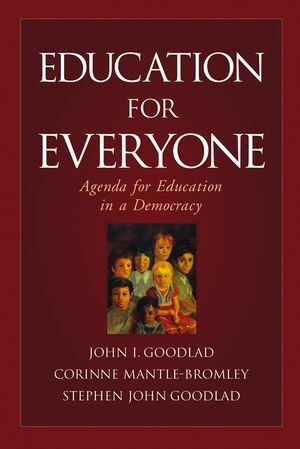 Stephen John Goodlad is a writer and philosopher whose interests center on the relationships between environmentalism, ecology, and democracy and, in turn, the implications of those relationships for education and schooling. He is the editor of The Last Best Hope from Jossey-Bass. 2. Agenda for Education in a Democracy. 3. The Context of Schooling in a Democracy. 4. An Essential Narrative for Schooling. 5. Democracy, Education, and the Human Conversation. 7. Leadership for Educational Renewal.